This time our deal hunting editors have brought you a travel deal to a less usual but not less interesting destination. Book this Los Angles to Pittsburgh flight for $387 r/t and travel in late November with a multiple airlines flight provided by United Airlines and American Airlines. We have found this Pittsburgh flight provided by Faregeek while searching on Travelgrove. To make sure that you find the cheapest airfare deal you should search 3-4 different providers and compare their prices. On the screenshot you can see that your plane will depart from Los Angeles International Airport (LAX) on November 18 and return one week later from Pittsburgh International Airport (PIT). You will have to change planes on the way to Pittsburgh in Houston – layover time is 51 minutes and on the way back in Chicago where layover time will be 1 hour 15 minutes. If you book this fight you will get award miles from two frequent flyer programs: 2,493 from Lufthansa SWISS Miles and More and another 2,241 from Iberia Plus. The multiple airlines airfare we have found for $387 r/t is cheaper than all the other fares we have found – check the details in the table and book the offer you like the most. 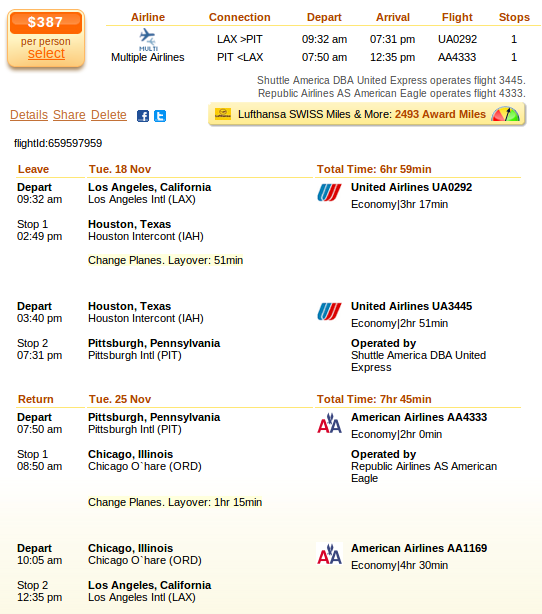 This entry was posted on Monday, October 27th, 2014 at 1:34 am and is filed under Airfare Deals. You can follow any responses to this entry through the RSS 2.0 feed. You can leave a response, or trackback from your own site.